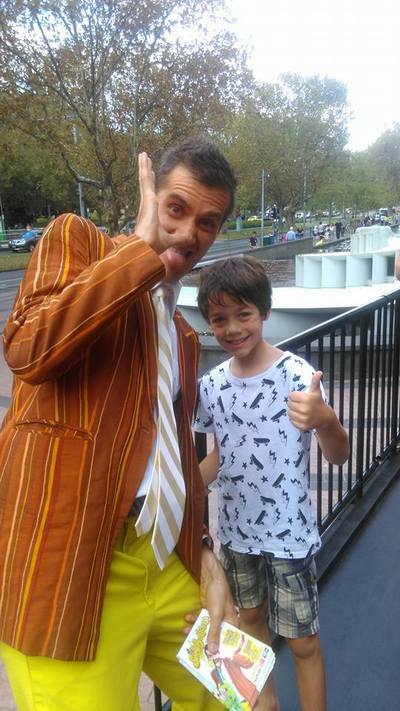 In recent years, Melbourne's annual giggle-fest has ramped up it's program for kids. There are 12 fun comedy shows for children in this year's Melbourne International Comedy Festival schedule, with all kinds of performances to get LOLs out of the little ones and grown-ups alike. It might be hard to choose a key act out of this year's program for children in the Melbourne International Comedy Festival, so if you're looking for a show that includes a variety of acts in one, I'd recommend you book in for the Comedy Club for Kids. 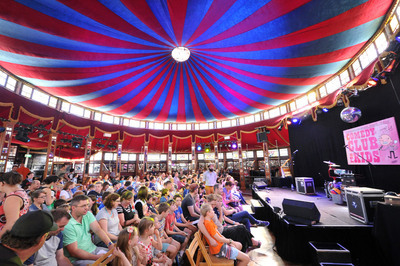 Situated in the The Famous Spiegeltent pop-up at Arts Centre Melbourne, the Comedy Club for Kids is an hour long laugh, with three different acts chosen from this year's festival line-up, along with the host of the day, either Josh Earl or Grandma (Nikki Britton). I must admit, on the balmy Autumnal day I took Mr3 and Mr8 along to enjoy Comedy Club for Kids, the Spiegeltent was a tad warm inside, but the kids didn't seem too bothered once I picked up some ice lollies from the al fresco cafe situated right outside Arts Centre Melbourne, just before the show started. Right from the onset, Josh Earl had the kids giggling with jokes about school, funny songs and a new take on the classic tale of "The old lady who swallowed a fly". On the day of our performance, we were entertained by Alex the Magician, who wowed the kids with fun tricks; a taster for his full-length show Make Your Parents Disappear. Then Mr Snot Bottom got to the stage and had the kids in stitches with his fart and bottom jokes. In the final act, comedian Tessa Waters invited a Dad in the audience to join her on stage for a little hula-hoop.. miming. No, there were no real hula-hoops involved, but yes lots of laughs were had! What's great about the Comedy Club for Kids is the little teasers of each comedian's solo shows. I also find shorter acts are easier on little kids' attention spans. Although I must admit, my 3yo was probably a little young to understand; the show is, after all, aimed at children 6 to 12 years. If you're not quite sure who to see in this year's Melbourne International Comedy Festival schedule for children, I'd suggest booking in to the Comedy Club for Kids. Laughs are pretty much guaranteed, and you might get inspired to book in to see another show at a later date. Bear in mind that comedians are on rotation in the Comedy Club for Kids, so if you book in, you might not see the same three aforementioned acts. If our experience is anything to go by, it won't matter, because I'm quite sure the other comedians will be just as funny! You've got just over a week to go to enjoy this year's Melbourne International Comedy Festival. There's no reason to leave the kids behind with a babysitter, book in for the Comedy Club for Kids and enjoy a belly laugh with the whole family.